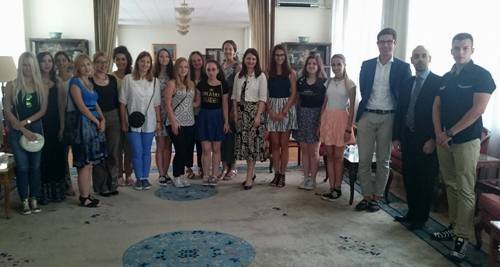 (Beijing, 9 August 2016) Students and pupils from Serbia learning Chinese language, participants of the International Summer Camp of the Confucius Institute (Hanban) at the Communication University of China in Beijing, visited the Embassy of the Republic of Serbia on 9 August 2016. They were welcomed and greeted by the minister counselor T. Panajotovic Cvetkovic and minister counselor B. Cvetkovic, who presented to the students the overall development of the bilateral relations of Serbia and China and stressed the importance and role of youth exchange, for the purpose of people-to-people exchange, learning of Chinese language and further convergence of the peoples of the two countries, as well as strengthening economic and social exchanges, which is defined as one of the strategic objectives of cooperation. Additionally, a meeting was held with representatives of the University Club for UNESCO, led by its president Kosta Zivanovic, during which it was discussed an intention of the Club to organize Youth Forum between Serbia and China at the end of 2017, regarding the role of youth in implementing the goals of sustainable development.